As expected, Barnes and Noble announced the launch of a new touchscreen E Ink Nook today, dubbed “The Simple Touch Reader”. It is available for pre-order from Barnes and Noble for $139, the same price as the Kindle 3 WiFi. It is expected to release on June 10th. Like the Kobo Touch that was announced yesterday, the new Nook Touch uses Neonode’s zForce technology for the touchscreen, which uses infrared to detect input. This is the same exact touchscreens that Sony uses with their ereaders, and they work fabulously in conjunction with E Ink screens. 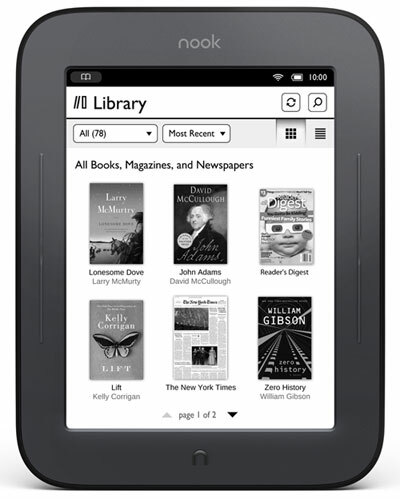 Speaking of E Ink, the new Nook uses the latest higher-contrast Pearl displays from E Ink. This gives it darker text with 50% better contrast and improved performance versus the earlier Nook. Additionally, the new Nook is 35% lighter and 21% more compact than the original. Battery Life: up to 2 months! With the release of the new Nook Touch, the original Nook will be phased out. In fact the Nook WiFi is selling for $99 new from Barnes and Noble’s eBay store while supplies last. Maybe I will sell my Nook 3G and buy this one instead. I sort of like the 3G feature on the Kindle, mainly because of the following subscription that is NOT available in the Nook bookstore. I don’t know, the large bezel might end up being an asset. You’ve got to have plenty of room to hold the device so you’re not accidentally brushing the touchscreen all the time. I noticed in the Kobo specs it states 2 weeks of battery life or 10,000 page turns. BN states it as 2 months for 1/2 hour a day or reading. I would like to see the BN model spec in terms of page turns, and then compare it to the Kobo and Kindle. Nathan, since this uses the adroid operating system, can you speculate on hacks and apps? I have a good feeling a hack will be out for the New Nook by the end of June. I hope someone can open it up enough to install other Android reading apps on it—that would be gold! One think I haven’t read is whether that MicroSD card is now accessible from the outside of the unit. The microSD card looks like it is easily accessible on the side of this new Nook. Make sure to hit the photo gallery link that I just added. There are a bunch of pictures, but I wanted to use lightbox to display them so they are over on the main site instead of on this post. The video shows adjustable line spacing and margin size, which is something some folks have been asking for. Also, TeleRead reports that B&N said that it shows the number of pages left in the chapter, and that’s something else that some folks have been asking for. Like NOOK Color, the new NOOK has no eReader PDB support. B&N has kicked their big Fictionwise customers out of the lifeboat. Apparently, it won’t be possible to use the new NOOK on public Wi-Fi systems where you have to enter anything — a password, click on “I accept the terms”, etc. — so it’ll be a bit more limited on where it can connect. It’ll be pretty much limited to home, B&N, and AT&T nets. On the other hand, since the Wi-Fi is only usable for connecting to B&N, that’s not such a big loss. I haven’t seen any reference to notes other than in this article. The “Sync bookmarks, highlights, notes, and last page read across other Nook devices and software” part triggers heavy cynicism on my part, since that was claimed for the original NOOK and never delivered. A year later, they did manage to sort-of deliver syncing of “last page read”. Overall, it looks like a real winner to me. B&N has clearly separated its two offerings into “pure e-reader” and “semi-tablet”, and neither one goes head-to-head with Kindle. I don’t think the new NOOK is pretending to be an upgrade for those of us with what’s now being called NOOK 1st Edition. It’s aimed at people who are considering their first e-reader and wouldn’t miss the stuff that’s been dropped. Spec-wise, it’s very close to the new Kobo. The NOOK wins on claimed (ahem) time between recharges, but I’m going to guess it loses big-time on PDF handling. It’ll be interesting to see how the actual implementations compare — the NOOK screen changes/page turns in the video sure are stunningly fast for E-Ink. Doug, it looks like you are right about the syncing and notes; I’ll remove that section. It’s hard to keep track sometimes when some do and some don’t. But I couldn’t find any definitive info about it at B&N. I can’t believe they don’t offer those features. I second the preference for a larger bezel. I had the Sony 350 for a couple of weeks but returned it ’cause I couldn’t find a way to hold it comfortably without touching the screen. I also like that they maintained the physical page turn buttons on either side. I’m tempted to pick this up however, I have this sneaking suspicion that B&N STILL didn’t make this capable landscape orientation. Do we have any news on that front? Nope. Still no landscape mode. I can’t believe they don’t add that. The Nook is the only ereader I can think of that doesn’t have landscape mode, in fact. I can’t understand why B&N don’t include landscape orientation. Is it that difficult/expensive to include in the specs? What am I missing here? It may seem trivial but landscape orientation makes a big difference when reading pdfs. I can’t stand the look of re-flowed pdfs (yuck) and zooming in is a bear because you’ll then need to deal with horizontal scrolling (ugh). The landscape orientation issue is one big reason why I picked Sony 350 over the e-ink nook. Oh well, I’ll just have to remain content with my rooted nook color. I think we should have a betting pool on how long it takes the folks at XDA to root this bad boy and put a browser on it. Given that the Nook Color was set to boot from the microSD slot first I cannot see how B&N doesn’t expect this to happen. While I unrooted my Nook Color (no huge advantage to it, given I couldn’t do the kids books that my daughter loves), I could see this being rooted quite effectively into a Nook/Kobo/Kindle machine. My guess is two and a half weeks. I’m switching from Kindle 3 to the Nook 2. This solves all the issues I have with the Kindle and adds some other features that really appeal. I wonder what limitations there will be to Android apps? Well, I just broke my 350 so maybe I’ll check this one and the Kobe out, although I’m sure the Nook will be hackable and not sure about the Kobe. Pro Tip; The PRS 350’s screen can’t take too much of a direct hit AT ALL. Dropped a salt shaker from maybe 6 inches and that’s all she wrote. Getting mine this weekend. Can’t Wait!! How are you going to manage that? They won’t be released until June 10th or so :).